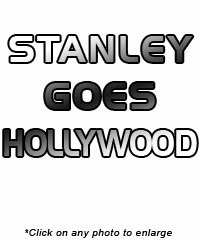 Jonathan Quick and Willie Mitchell brought Stanley to Venice Beach. 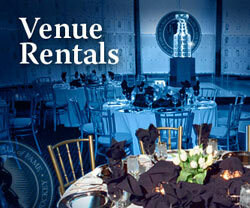 Life�s a Beach! 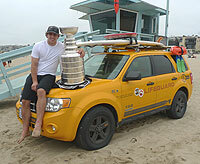 This time Stanley was the guest of Anze Kopitar at Manhattan Beach. 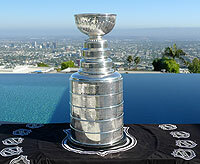 Stanley perched atop a table at the home of actor Matthew Perry. 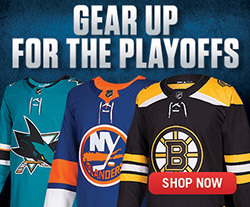 Former star of the popular television sitcom, Friends, Matthew Perry takes a sip from The Stanley Cup. 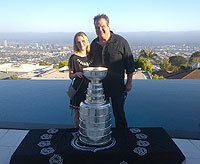 Star of the hit television show, Modern Family, Eric Stonestreet, gets his photo taken with The Stanley Cup. 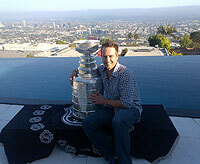 Actor Michael Vartan has his photo taken with The Stanley Cup. 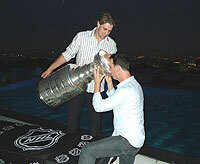 Actor Colin Hanks takes a sip from "Hockey�s Holy Grail" which is held by Anze Kopitar. David and Victoria Beckham pose for a photo with The Stanley Cup, Anze Kopitar and Ines Dominc.